From the people that brought you Dead Cow Wave, in our continueing efforts to find small, out of the way features that are user friendly and easy to learn on bring you ZOOLANDER. A small ledge hole just outside of Idahna, Or on Hwy 22. Zoolander is a small, righty carthweel and spin spot on the Bruno Mt. 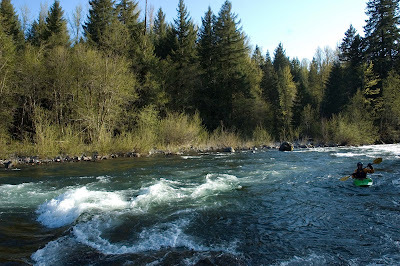 run on the North Santiam. Otherwise know for its play at higher flows, this run should keep all but the pickiest big feature fanatics at bay. This also means never a line up. As the name implies, its a right carthweel ONLY spot. There is a retentive and deep enough pocket on the surfers right but anyone who attempts a lefty will be rewarded with a sound THUMP and probably flush upside down. Vertical right to left splits are easy enough though. Its also pretty friendly for side surfing and spinning. The eddy is a bit flushy out the back so a quick roll is handy to avoid hiking. One more thing... Just like Zoolander the movie, this hole may not be worth a special trip. If you are already out that way I highly recommend a stop. If you are serioulsy cartwheel challenged, this is a really great spot to dial in your edge control and body position. Improvent here will be immedialty rewared with more ends and more retentive rides. I've been out to it between about 1000 and 1300. I expect the range is a bit wider than that too. To get there, head East on 22 past Detroit. Once through Idahna, look for some green metal buildings on the south side of the road. Just past these, where the guard rail starts, is a turn out. Hike up river from there and put in just upsteam of the speed limit sign. If you are doing the run, look for a Triangular rock in the middle of the river about 1/2 mile past Cooper Ridge Rd bridge. The hole is on river right. Have a great time, let me know how it goes. CK exhibiting good dental hygiene at the put in of Canyon Cr. 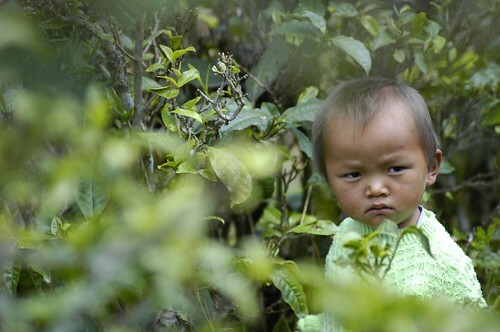 The plan was simple: Two days, 4 rivers. 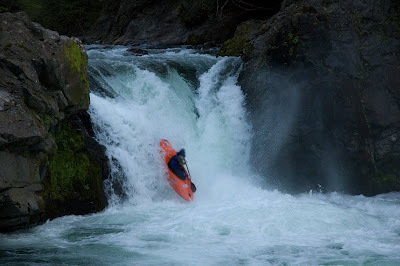 A little playboating on the North Santiam, up into Washing to pick some lines through on Canyon Cr Washington for the extreme race in a week. Next day, Little While and Green Truss. Seemed simple. Day one went ok, Bruno Mt was at about 1000cfs. There's some fun play out there at that flow including a righty cartwheel spot. Up to Canyon Cr where the lack of water was a bit disappointing, but expected. Low water clean lines are the key to doing well in the race. Me at Thrasher, skying the rock boof. Day two: Our third, and shuttle, couldn't make it but set us up with his roommate and local paddler Jason who was kind enough to run shuttle for the price of a Hamms. We put on the Little White and I started hacking up the lines: missing boofs, catching edges in Getting Busy. Nerves built on nerves and Island came up soon. As we were scouting I noticed my boat full of water and after emptying it out saw the 5" crack across the bottom. I know I'm not the first to break a boat out there I know. On my first trip down, three people hiked off because of broken boats. I followed suit while Chris decided to finish out the run solo. I guess it went great for him and I did alot of second guessing my decision on the 2.5 hour hike upstream. After staring at a map later, I realized there was a road just up hill on the left. Damn. After a while at the put in, Chris showed up with the van and we drove back into HR to stop at the Shed on our way out of town. A kind of anticlimactic and slow end to my first Little White Hike. 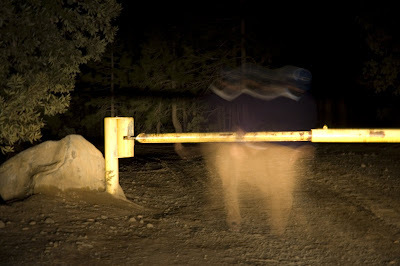 This weekend I spent some time over in Central Oregon looping it up with Liquid Logic lady, Christina. Groom Lake is fun little hole that is an auto-looper or great for space godzillas. Even ran into a few other friend out there, Hattie and Mike.godzillas. Even ran into a few other friend out there, Hattie and Mike. Big thanks to the LLLL for showing me the ropes and Christina for having a camera handy to make it look like I know what I'm doing. Go paddle! For more photos, check out my Flickr site. 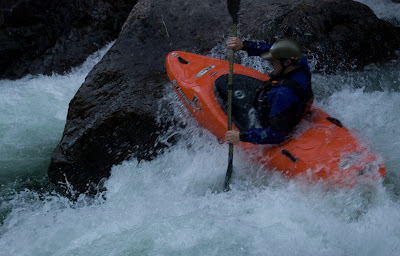 Some of my favorite photos are there from the past few years of paddling in the Northwest! 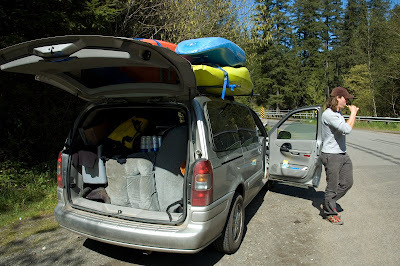 This past weekend four of us from Corvallis headed down to the Feather drainage hoping to hope on some of the goods. Against advice from a few friends, James Bagley, Jeff Hazboun, Chris Korbulic and myself went hoping for West Branch runs. 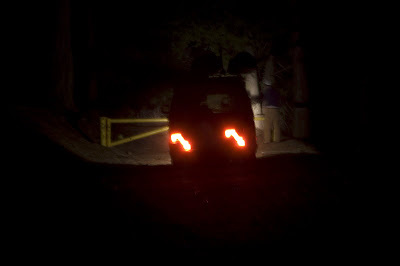 After hours of driving around on forest roads we gave up at about 1:00 am Saturday morning; we camped at Gate# 1 deciding to hit Bald Rock in a few hours. In the morning, on the road and a few phone calls later to some locals, we were told that Milsap Bar gauge was reading low, the level was already near the recommended max and it was raining and our local wanted nothing to do with it. We ran shuttle, and put on at noon. 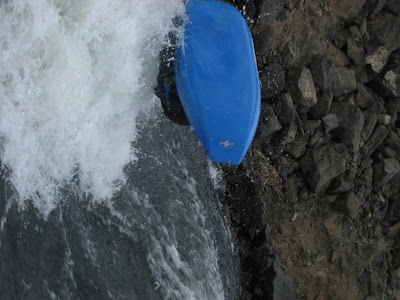 I think we were all pretty nervous till after the portage around Atom Bomb Falls. Lots of solid V drops, lots of bank and boat scouting, a few portages including Curtain falls and we finished the run about 6:20pm. I can easily say I have never dodged so many sieves and undercuts in my life and my heart was pumping the whole way down. No photos in the rain and the time crunch. James shot some video so hopefully he puts somthing together! We were all pleased to be at the lake, in a limited sort of way. Happy to be at the bottom safe, happy to have had safe lines all around... no so pleased looking forward to the 4 hr, 13 mile paddle out. At 10:30pm Saturday night we stumbled up the steep bank by the van, made some food, toasted our arrival and went to camp at the put in. Up at the crack of 9, on the road by 10 searching for access to Big Kimshew again. This time, more dirt roads, and deep Cali red clay stopped us. No photos: I was too busy trying not to get stuck and helping James not to slide into the ditch. In the end, we were skunked on Sunday. Big Kimshew will have to wait till the next trip when we figure out the gates down there. I'll post more pictures then. to know about me. This post is all about just that, its going to be a place I can keep track of my achievements. I'll update it as things change. I started paddling at age 9 in Florida and, it being Florida, the boat was 16'6" long and 20" wide and the paddle was a 90 degree 235cm. 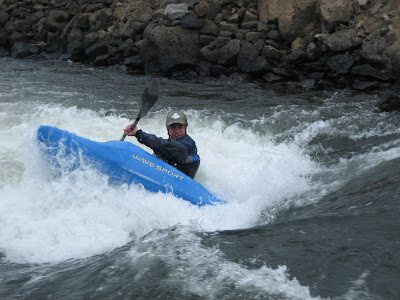 It wasn't till I moved to Washington that I started to spend anytime on rivers and even then only occasionally. In April '04 that I got my first playboat and From then on I've been hooked. 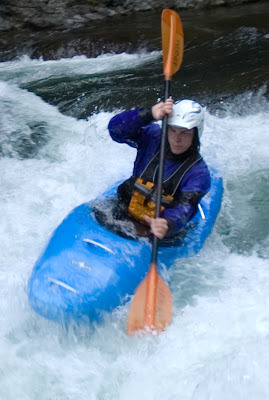 I've paddled rivers all through the northwest though my favorites are still where I learned: the Skykomish in Washington. 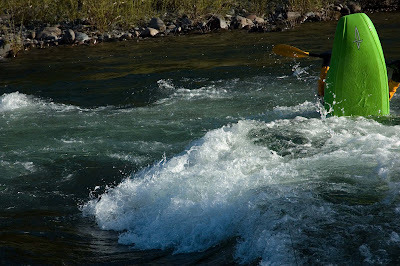 The Sky is still my favorite river just for the runnability (all year) and variability (you can run it everyday of the week and take a different line though Boulder Drop each day). 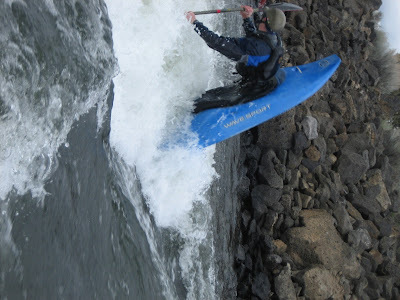 Since moving to Oregon the number and steepness of the rivers I run has increased dramatically and the last 2 years have been wonderful in terms of paddling. To anyone who wants to paddle more, I recommend Graduate School. Even they, however, will eventually kick you out. So now, I am armed with a Masters in Molecular and Cellular Biology, a minivan and a will to paddle before I let my life become the sum of 9 2 5. 16 if you are keeping track. 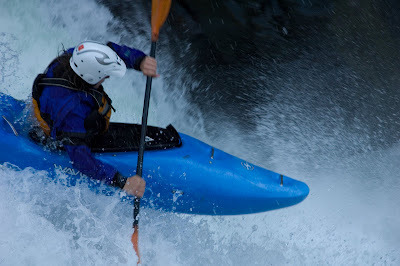 To me kayaking is about challenging myself and growing through those experiences. 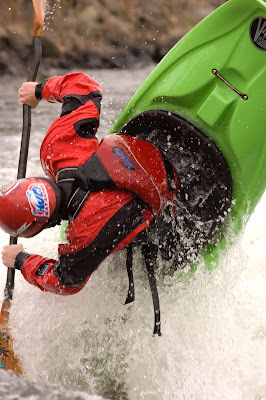 Challenge take the form of a new move, a bigger drop or teaching people on the river. 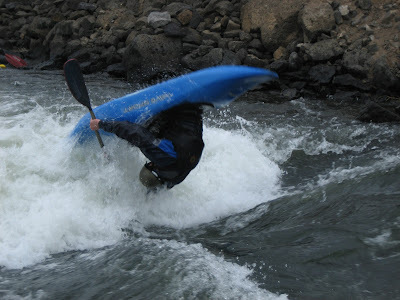 I get the same joy out of running a big drop as when someone I am paddling with gets their first spin or cartwheel. 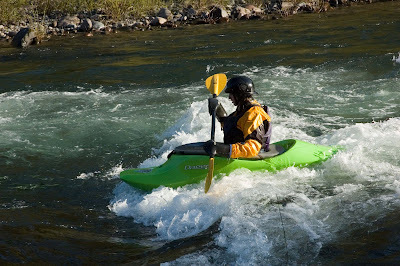 Its a choose your own adventure sport whether its Class II or Class V+, river running, creeking or playboating, its all a part of this river life. 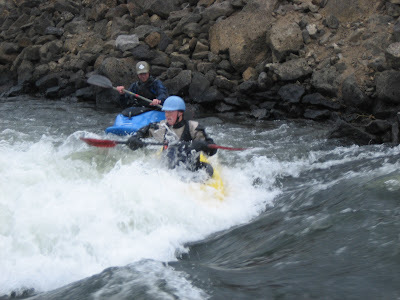 Oregonkayaking.net: One or two write ups and a whole load of photos. Thanks Jason! Big thanks to Jason, Ryan, James, Jim and all the others who spent time on the vids. 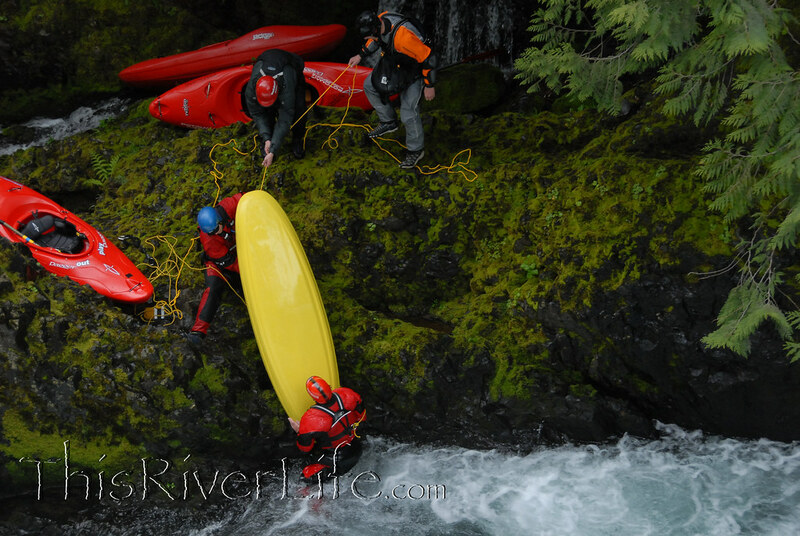 Syndicated news story and footage of out trip down the Oregon Salmon River Gorge in June 2007.